The play "Tamura Maro Suzuka Gassen" was originally written by Asada Icchô and Toyoda Shôzô for the puppet theater (Bunraku) and staged for the first time in the 9th lunar month of 1741 in Ôsaka at the Toyotakeza. From 1798, the 4th act of this drama became an independent drama, which was entitled "Seishû Akogi-ga-Ura" and which was somehow based on the legend told in the Nô drama "Akogi". When was it staged for the first time in Kabuki? Two dramas, which were entitled "Seishû Akogi-ga-Ura", were staged in Ôsaka in the 11th lunar month of 1763 and the 7th lunar month of 1765 but they were different works. 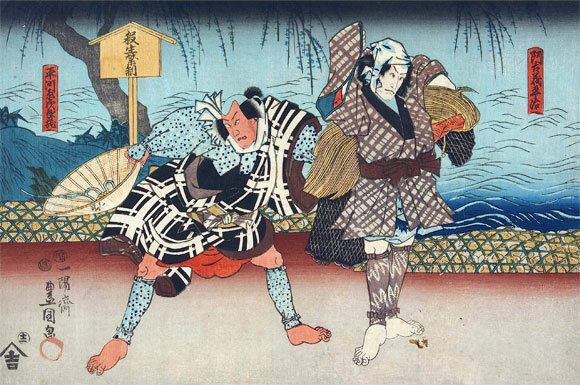 "Seishû Akogi-ga-Ura" was adapted for Kabuki for the first time in the 10th lunar month of 1819, in Edo at the Nakamuraza [casting]. This drama is rarely-staged nowadays. During the second half of the 20th century, it was staged in ôshibai only once, in August 1958 at the Shinbashi Enbujô, starring Nakamura Ganjirô II, Jitsukawa Enjirô II and Kataoka Gadô V in the roles of Heiji, Jirozô and Oharu. "Akogi-ga-Ura" is made up of two scenes, "Amiuchi" ("Fishing with a Net") and "Heiji Sumika" ("at Heiji's House"). The mother of Akogi no Heiji, a fisherman, has been ill for three years and shows no sign of recovery. One dark night, after the visit of Rin'emon, the family doctor, to the patient, Heiji accompanies him on his return with a lantern to light his path. While walking together the doctor tells Heiji that the only possible way to cure the serious illness of his mother is to supply her with a rare fish named yagara found only in Akogi Bay where fishing is strictly prohibited because it is a preserve belonging to the Grand Shrine of Ise. Wishing to cure her illness by all means, Heiji fishes for the rare fish at night in violation of the law. Hiragawara no Jirozô, another fisherman who has been poaching every night, is also fishing but Heiji does not notice his presence. Heiji casts a net and brings up a precious sword instead of a yagara. When he is about to cast the net again, Jirozô beats wooden clappers as a signal indicating the discovery of a poacher. Though Jirozô is himself a poacher, he apparently feels it would be good if the newcomer could be caught because the authorities already know that someone is poaching every night. Jirozô tries to catch hold of Heiji in the dark. After a struggle, Heiji flees but his straw raincoat and sedge-hat remain in Jirozô's hands. Heiji lives with his sick mother, wife Oharu and son Tomoishi. Oharu, who is the daughter of General Tamura, whom Heiji formerly served, tenderly nurses her mother-in-law. The shôya Hikosaku visits Heiji and tells him that a poacher was discovered but got away, leaving his straw raincoat and sedge-hat. As the hat bears the name of Heiji, Hikosaku suspects that the poacher may be Heiji himself. He declares that if a poacher is arrested his entire family will be punished but if he surrenders himself to the police the family will be spared. Heiji says that he has never poached and drives Hikosaku away by threatening him with a sword. After Hikosaku has gone, Heiji tells the truth to his wife, saying that the sword caught in his net is one of the Imperial Regalia which his former master, General Tamura, is looking for. Presently, Jirozô visits Heiji with Hikosaku as his guide. Jirozô demands that Heiji surrender the precious sword to him. Heiji refuses and the two men draw their swords to fight. Seeing that Heiji is a better swordsman than he, Jirozô catches hold of Heiji's son and threatens to stab him to death. Heiji thereupon pleads with Jirozô to bury the hatchet. Revealing that he was formerly General Tamura's retainer, he asks Jirozô to go to Kyôto together with Heiji's mother, wife and son and present the Imperial sword to the general for him. Hikosaku, who has been overhearing the revelation, attempts to go away to inform the police of Heiji's crime, but Jirozô quickly catches him and kills him. Then Jirozô says that he formerly served Heiji's late father and that he is the foster son of a Shinto priest responsible for the loss of the Imperial sword. It was in order to recover the sword, which was at the bottom of Akogi Bay, that he has been poaching every night. Hyôgo, the local magistrate, accompanied by constables, visits Heiji to arrest him. Heiji offers himself without resistance but Jirozô interferes, saying it is not Heiji but himself who has poached, The local magistrate insists that Heiji is the criminal and shows as evidence the sedge-hat bearing the two Chinese characters "hei" and "ji". Jirozô refutes him saying that the two Chinese characters actually do not represent Heiji's name but are the first ideograms of both Jirozô's family name Hiragawara (the Chinese character for hei can also be read hira)and given name Jirozô. The local magistrate, though fully aware that Jirozô's far-fetched explanation is not true, pretends to accept his interpretation and arrests Jirozô instead of Heiji because he has been moved by Jirozô's self-sacrificing devotion to Heiji. The way has thus been cleared for Heiji to go up to Kyôto personally to present the Imperial sword to General Tamura.